Founded in 1959 by Frank Flaman, this is where the Flaman Group of Companies got its start. Southey is the home of one of our two Grain Cleaning locations across the province, with the other being in Saskatoon. Here, we sell grain cleaners, such as air and screen cleaners, clean to seed cleaners and dockage cleaners, seed treaters, along with color sorters, bucket elevators, drag conveyors, BoMill, and Kwik Kleens. We are western Canada's largest custom screen manufacturer. We also sell parts for various makes of grain cleaner and offer service for our equipment. We offer a wide selection of grain cleaning and seed cleaning equipment, from small to mid size to full size to fit the size of your operation. Our specialty equipment includes grain moisture testers, protein analyzers, seed counters and more. For bulk storage we offer bucket elevator systems as well as an assortment of accessories. We sell a full line of trailers, from stock and horse trailers, to flat decks, Ag transport trailers, utility trailers and much more. For farm hardware, we are heavily invested in helping you get set up with what you need to get your product on/off the ground as quickly and efficiently as possible with a diverse variety of chemical handlers, water and fertilizer tanks, wire rollers, and a huge selection of pumps and attachments for your seeders. We also deal in rentals. Just like each other store, we rent a wide variety of trailers, including flat deck and enclosed trailers, with sizes ranging from 10' to 24', as well as other agricultural equipment such as grain vacs, discs, bale carriers, post pounders and heavy duty mowers. Flaman Grain Cleaning is located one mile north of Southey on Highway 6. 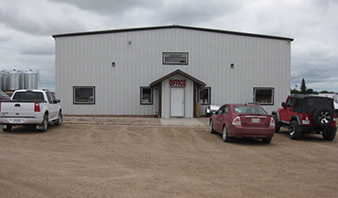 Flaman has become a leading supplier of Grain Cleaning equipment to Saskatchewan farms. So come on down and see us, we've always got a pot of coffee and friendly knowledgeable staff, the kind you've come to expect from a company built on the honesty and respect of a family business.